Victor Vasarely, leader of the Op Art movement of 1960’s, used disorientating effects to create often impossible images to the human eye, such as these Vasarely prints and sculptures. He is widely accepted as a ” grandfather” and leader of the op art movement. Our fine art gallery has the finest quality Victor Vasarely original prints and screen prints. We have a large inventory available off-site and we encourage you to make an appointment to see specific works you are looking to collect. We are happy to meet you at either our art gallery showroom or at your home or office for a private presentation. 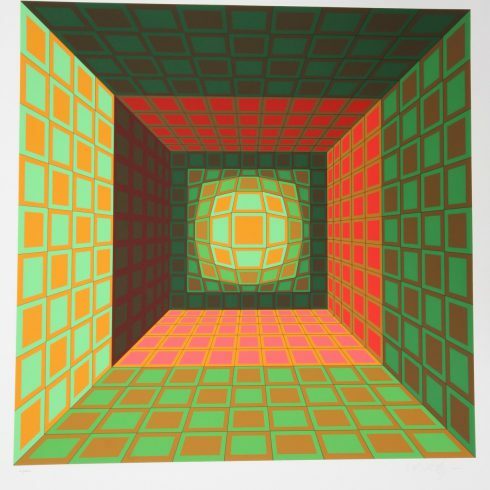 Victor Vasarely was a French-Hungarian artist credited as the father of the Op Art movement. Utilizing geometric shapes and colorful graphics, the artist created compelling illusions of spatial depth, as seen in his work Vega-Nor (1969). Vasarely’s method of painting borrowed from a range of influences, including Bauhaus design principles, Wassily Kandinsky, and Constructivism. Born Vásárhelyi Gyozo on April 9, 1906 in Pécs, Hungary, he briefly studied medicine at university, but after two years dedicated himself instead to painting. In the late 1920s, Vasarely enrolled at the Muhely Academy in Budapest, where the syllabus was largely based on Walter Gropius’ Bauhaus school in Germany. After settling in Paris in 1930, Vasarely worked as a graphic artist while creating many proto-Op Art works including Zebra (1937). The artist experimented in a style based in Surrealism and Abstract Expressionism during the 1940s, before arriving at his hallmark checkerboard works. Op Art went on to have a number of practitioners, including Bridget Riley and Yaacov Agam. The artist died at age 90 on March 15, 1997 in Paris, France. His works are presently held in the collections of the Albright-Knox Art Gallery in Buffalo, the Art Institute of Chicago, the Tate Gallery in London, and the Peggy Guggenheim Collection in Venice.